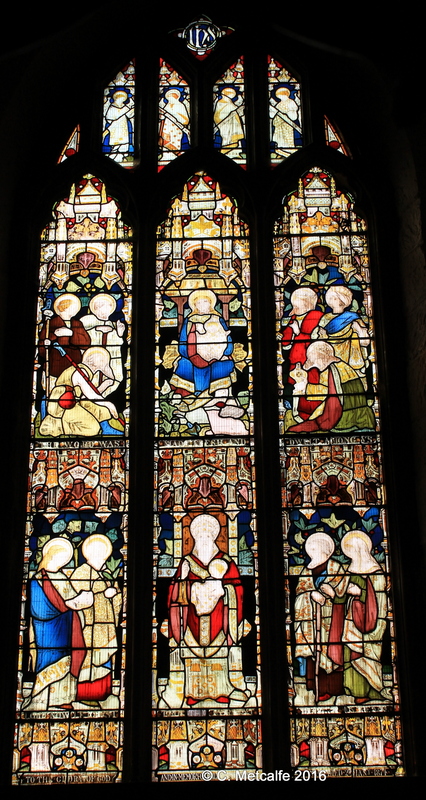 This stained glass window depicts scenes from the early Life of Jesus. You can find this window in the Memorial Chapel, to the right of the main altar and in the south wall. The window was given in memory of William Stenning, who died in 1874, and is the work of Messrs Powell. The pictures are not as clear in this window as in some of the other windows, but the glass lets in the light in shafts of beautiful colours when the sun shines. In the upper section, the scenes are: the Nativity of our Lord (centre), the visit by the Shepherds on one side, and the visit of the Wise Men on the other side. In the lower section, the scenes are: the Presentation of Christ at the Temple, and Simeon and Anna seeing the young Christ. We can find the story of the Wise Men in St Matthew’s Gospel, and the story of the Shepherds, and the account of Simeon and Anna seeing the baby Jesus, in St Luke’s Gospel. 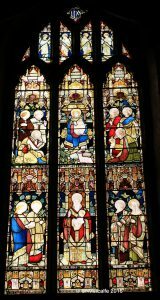 These fragments about the early life of Jesus were lovingly depicted in stained glass for the congregation, in memory of William Stenning. The window continues to enhance worship and to give us pause for thought when the light streams in, well over a hundred years on.